FA: Joe French and Bryan Bird, 2002. This is a natural and wandering line up the west face of the peak. Three out of four of the pitches are excellent. 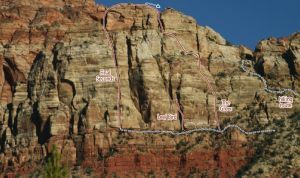 Pitch 3 is extremely loose but for a Zion connoisseur it’s worth it to get to a cool summit. Rack: 2 ea .5-4”, 1 ea 5-6”, 1 rope. Descent: down climb and hike down the south ridge to a notch with large pinion pine tree. Walk north out of the notch on the west face and zigzag down ramps back to the base. This descent route makes for an excellent rest day hike. Which SuperTopo guidebooks include a topo for The Greer?